LONDON (CNNMoney) — The United States will overtake Saudi Arabia to become the world’s biggest oil producer before 2020, and will be energy independent 10 years later, according to a new forecast by the International Energy Agency. 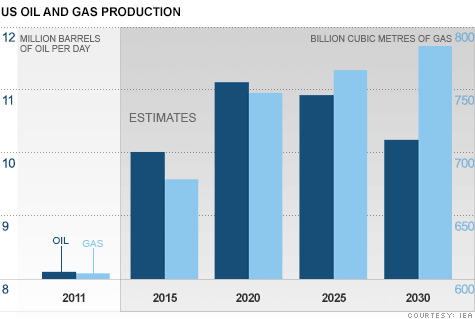 The recent resurgence in oil and gas production, and efforts to make the transport sector more efficient, are radically reshaping the nation’s energy market, reported Paris-based IEA in its World Energy Outlook. “But even with these and other new policies in place, a significant share of the potential to improve energy efficiency — four-fifths of the potential in the buildings sector and more than half in industry — still remains untapped,” the IEA stated.